I’m not saying I started a fashion trend by wearing a blue shirt and khaki pants almost every day, but ever since I started, I’m noticing more and more people sporting this no-nonsense combination. 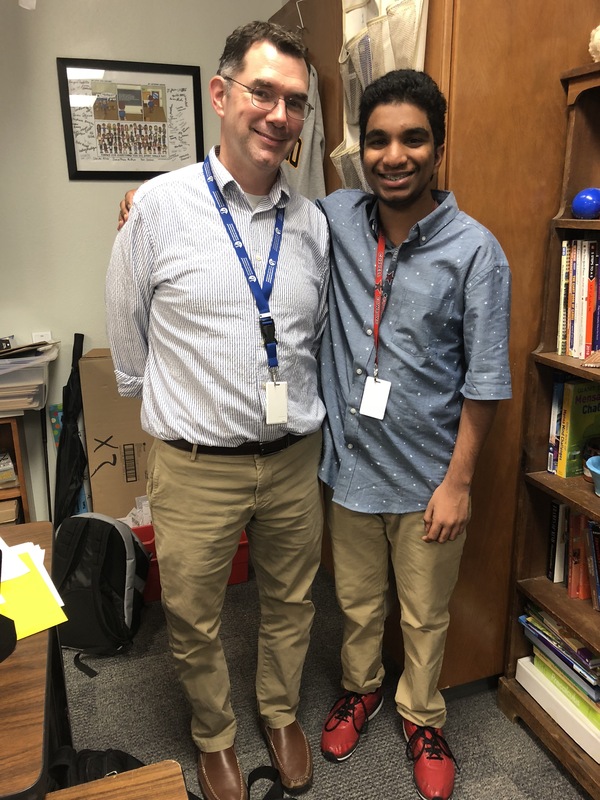 Blue Shirt Khaki Pants – It’s a Thing – Ronak I.
Ronak is in my Calculus class, and to say he’s a character is an understatement. He’s a sharp dresser, a talented dancer, and a worthy opponent in a battle of wits. 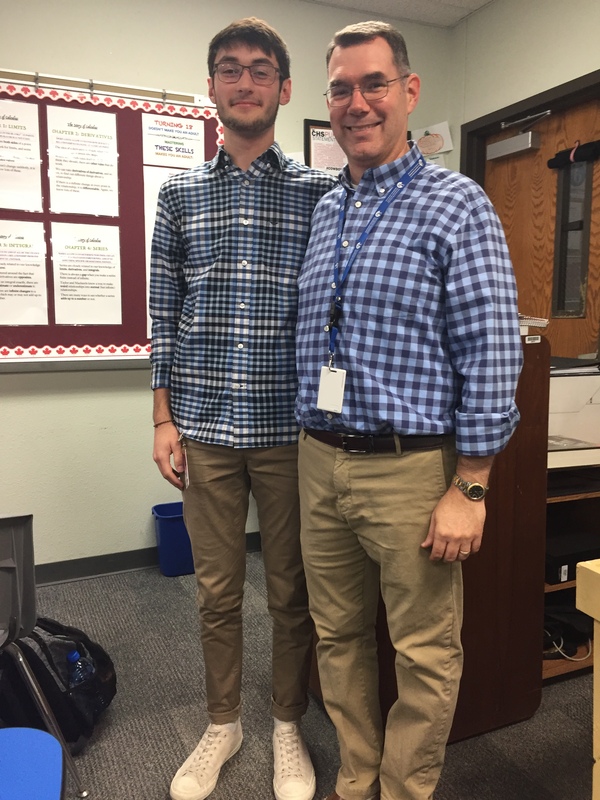 I enjoy teaching him this year, and I look forward to teaching him again next year when he’s in my IB Math class. Mr. Orlopp and I used to be right across the hall from each other. 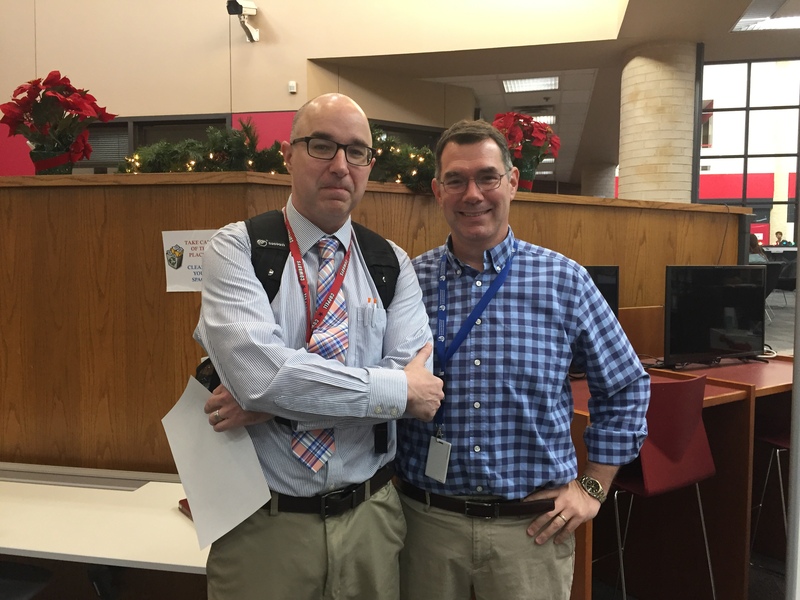 A formidable member of the IB team, teaching senior English, and the only man I know with a drier wit than mine. 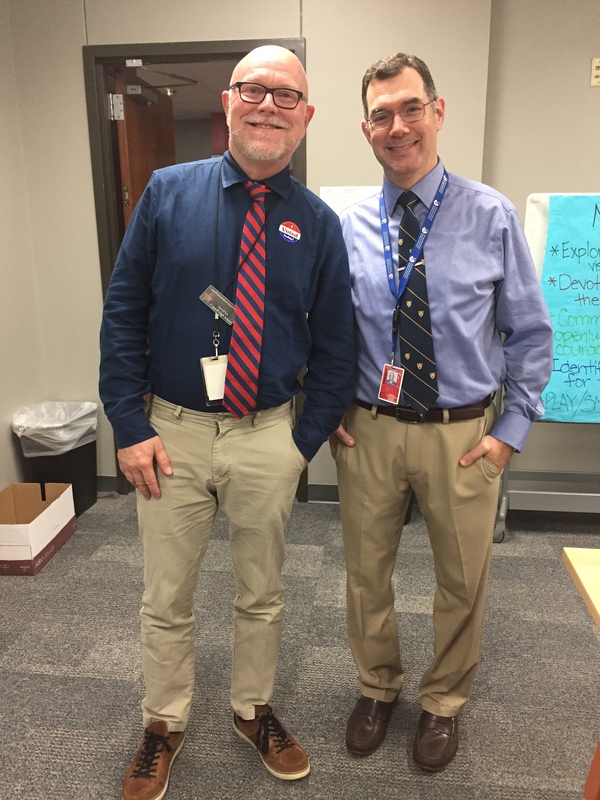 We’ve become close friends in a short period of time, mainly because of our close-knit IB teacher community, and I am very thankful for his leadership and camaraderie. Sadly, we are not in the same hall anymore, but we do get to spend Tuesday and Thursday mornings tutoring in the library together, and there’s always the annual murder mystery party to look forward to. I would follow this man to the ends of the earth, even if he admitted to being even a little disoriented. He’s a loyal friend and an incredible teacher. This man has been a fixture at CHS since I started 13 years ago. He has always been reliable and consistent, and an honorable role model. 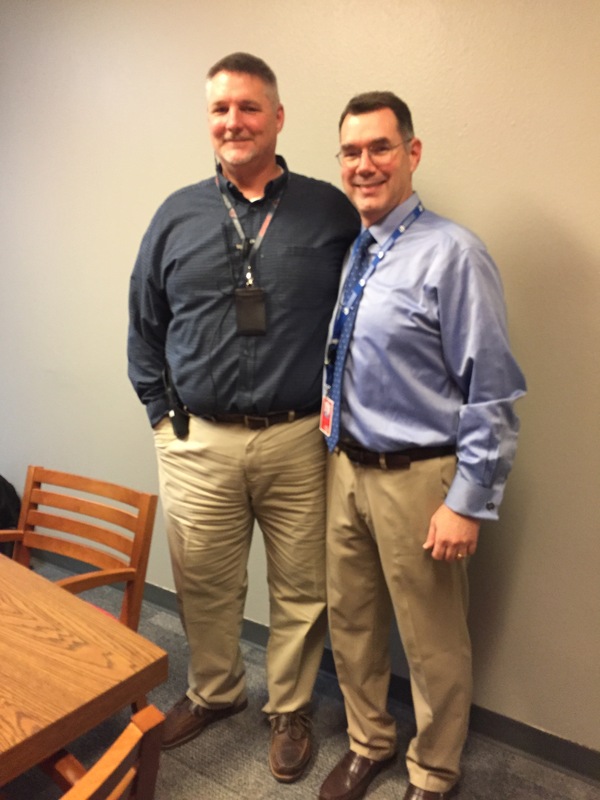 As an Associate Principal, Sean Bagley has a lot on his plate, but you’d never know it with his happy easy-going nature, always willing to share a funny story, or to just spend some time chatting. I look forward to seeing this remarkable man in the hallways in my many years to come at CHS. Blue Shirt Khaki Pants – It’s a Thing – Ryan B. This is my first year teaching AP Calculus BC, and Ryan is in the very first class I taught this year. Brilliant and kind, and a master of the four-letter-word game, it’s an honor to know him and a joy to teach him. I have been at Coppell High School for 13 years, and I remember meeting Derryl my first year. There are those teachers you meet in your career that are exemplars of passion, integrity, and selflessness. Derryl Lee is one of those teachers, and is regarded as a pillar at our school. Former Spanish teacher, now an Instructional Coach, his excitement for teaching has never flickered, and his innovation inspires me daily. 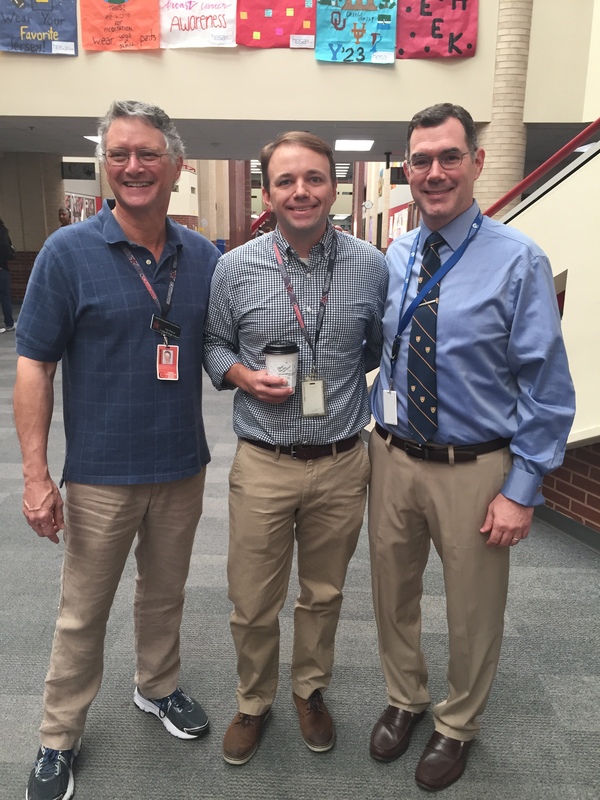 I met Tim Watson (left) when I taught Summer School in Coppell some years back. He was the Summer School Principal at the time. I’ve known John Watkins (center) ever since I helped interview him before he started working at CHS. I admire the leadership in both of these men, and I am proud to call them my colleagues and friends.